Starring Omar Sharif, Julie Christie, Geraldine Chaplin, Rod Steiger, Alec Guinness, Tom Courtenay, Siobhan McKenna, Ralph Richardson, Rita Tushingham, Klaus Kinski, Noel Willman, Geoffrey Keen, Adrienne Corri, Jack MacGowran. After his smash 70mm hit Lawrence of Arabia, British director David Lean turned to the Nobel Prize-winning book Doctor Zhivago. Producer Carlo Ponti wasn't about to set Lean loose for two years to burn millions of feet of 65mm negative, especially since the film spanned the history of the Russian Revolution and presented logistical problems much broader than the desert-set Lawrence. The biggest Western movie ever about Communism was largely filmed in Franco's Fascist Spain, with winter landscapes shot in Finland and elsewhere. Now a prima donna cinema artist with access to the largest and most expensive filmaking resources available, David Lean turned the casting process into a revolving door, courting names like Brando and O'Toole, turning away other big stars, and holding grudges against those that didn't sign on for the privilege of working for him. Ponti had some explaining to do at home, as he'd originally grabbed the film rights with the intention of starring his wife Sophia Loren. Producer Ponti needn't have worried. Although critics were waiting in ambush to take Lean down a few notches, Doctor Zhivago became one of the biggest hits of the 1960s, with Maurice Jarre's "Lara's Theme" becoming a best seller on its own. Although Omar Sharif wasn't applauded, Julie Christie leaped from British art film status to the front line of in-demand actresses. Doctor Zhivago had an intense audience appeal in 1965. Even in smaller communities it was a Road Show attraction, like the same year's The Sound of Music. It seemed to play everywhere, forever; and I remember going back a second time because my girlfriend wanted to see it again. All those fur coats and snowdrifts were considered very romantic. Zhivago and Lara shivered and suffered, but they struck very romantic poses in the process. The story sees individual lives swept away by a new impersonal society. Graduating from medical school, published poet Yuri Zhivago (Omar Sharif) turns down research in favor of general practice because he wants to know more about life. Yuri is shocked to see Imperial dragoons cut down peaceful demonstrators on the street outside his house. The beautiful Tonya (Geraldine Chaplin) returns from school in Paris, her engagement to Yuri practically a foregone conclusion. 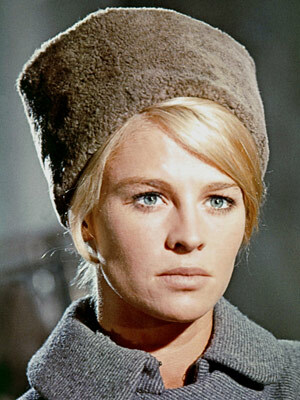 But while out on a case Zhivago is attracted to Lara (Julie Christie), a dressmaker's daughter. The mother's lover, political opportunist Komarovsky (Rod Steiger), seduces Lara and is soon meeting her in private restaurant rooms. Lara's boyfriend Pasha (Tom Courtenay) is a committed revolutionary unaware that his intended is Komarovsky's mistress. First comes war and then revolution. 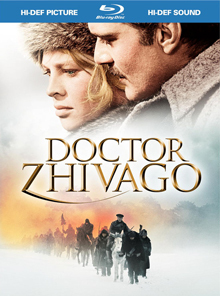 Zhivago serves as a war front doctor, where he re-meets Lara, a nurse volunteer; Lara's husband Pasha has disappeared. Zhivago returns to Moscow to find his house occupied by strangers under the new communist plan. Because his estranged brother Yevgraf (Alec Guinness) is a political policeman, Yuri and his new family -- Tonya, their son and her father Alexander (Ralph Richardson) are permitted to leave Moscow for the Urals. They pass through regions torn by civil war and begin a struggle to survive as the country is restructured into a new, harsh order. One major critic in 1965 thought that a lot of Doctor Zhivago looked cheap, a laughable statement considering the lavish production values on screen. A major street in Tsarist Moscow is recreated on a grand scale and the film does not lack for lavish set pieces. Yes, the story as adapted by Robert Bolt does boil down to an extended soap opera, but David Lean should be praised for not trying to turn what is essentially a tragedy into a feel-good romance on the Volga. The script compresses a great deal of content into its 3+ hours by sketching its major chapters into brief but effective vignettes. WW1, for instance, is represented by a couple of very dynamic moments of trench warfare and a troop mutiny on the road back to Moscow. 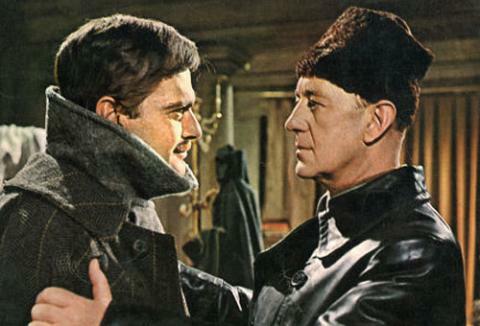 Some reviewers chided Doctor Zhivago with the accusation that Lean's pictorial approach reduces history to tidy, attractive clichés. War is Bad, we learn, when a Red Army brigade machine guns fifty soldiers in a wheat field, only to find out that they're schoolchildren. The sight of pretty white uniforms lying dead in the field does play like an antiwar commercial. The scene makes for a good comparison with a similar setup in John Ford's The Horse Soldiers. John Wayne proves that our Civil War was civilized when he orders his raiders to retreat from a corps of Confederate Kiddie Cadets, milking the entire situation for noble sentiment. Critics also slammed Omar Sharif, his watery, soulful eyes excepted, as an uninspiring Zhivago. The doctor-poet has the strength of his convictions but must yield to changing circumstances time and again in a very non-heroic way. Yuri Zhivago seems dull only because he's surrounded by more interesting supporting characters. Rod Steiger is a dynamic Komarovsky but our real attention goes to Tom Courtenay. His Pasha Antipov goes from student activist, to scarred anti-government agitator, and finally to a position as a feared strongman for the revolution. After nailing all the best scenes in the first half of the movie, Pasha throws a shadow over the second half with only one more short scene and a couple of dynamic close-ups. Frankly, his character arc is the most fascinating in the show. David Lean strove to rethink Doctor Zhivago in visual terms, which is commendable in all aspects; but the critics are somewhat justified in their criticism of Lean's parade of pretty pictures. Audiences swooned to see those beautiful stars embracing; this may be the most gorgeous tale of human misery ever put on screen. Unfortunately, Lean's pictorial-editorial mechanics break down whenever he seeks to represent Yuri's poetic imagination. Maurice Jarre's music soars while ice crystals melt on a frozen windowpane (the rebirth of Yuri's spirit!) and fields of yellow flowers bloom (Lara's passion blooms anew!). Alone in the middle of a vast forest, the weary Zhivago need but glance up at the sun glittering through the trees to become reenergized with life and living. When Yuri and Lara come near one another on a streetcar, Lean cuts to electric sparks popping on the wires above to represent their elemental attraction. The effect comes off as trite. In the WW1 scene, a view through Pasha's broken glasses seems a nod to visuals from Eisenstein classics. As the shot helps cap a very effective battle scene, this gets a pass. But we squirm when the film attempts to show Zhivago's writing process. Even with Jarre's music providing accompaniment, it's still just a picture of a guy crumpling papers in frustration. The music mickey-mouses the scene so closely, we want to tell Yuri to relax and go with the flow of inspiration: "Use the force, Yuri!" The music seems to take over and write Yuri's poetry without his actual input. It's almost as naïve as the wonderfully giddy sequence in the old movie The Great Waltz. Composer Strauss begins humming a tune while inspired by birds and clip-clopping horse hooves. During a montage of rapturous dancing and singing, a timeless waltz writes itself. Back in 1965 we were duly impressed by Zhivago's long walk through snowdrifts, with his face covered with icicles. That's the Russia we were raised to expect. The movie felt cold, the way Lawrence felt hot. Although the story is fairly simple, many important events in the latter half of the movie occur off screen. I remember talking to people who hadn't a clue who Komarovsky and Strelnikov are, what army has kidnapped Yuri or why Yuri and Lara's lives are in danger. Everybody frets about arrests and liquidations, but we don't really see anything beyond a cloud of smoke hanging over a village. Like a fussy cat, top critic Pauline Kael sniffed at Doctor Zhivago, apparently because Lean didn't revise Pasternak's story with an overt anti-Soviet theme. Unlike other White Russians who fled abroad, Zhivago remains in his motherland because he loves it. Yuri remains the spirit of Russia even when bad health drags him down, sometime around 1930. Lean frames the story as a flashback told by Yuri's brother Yevgraf, from a hydroelectric dam some time in the Stalin purge years. Yuri's daughter (Rita Tushingham) is a good proletariat worker who can't believe she's the daughter of the famous Lara, the inspiration for Zhivago's greatest poems. Ms. Kael fulminated against Lean's final image of a rainbow over that Soviet dam, which she took as an endorsement of Stalinism. As much as I admire Pauline Kael's insights, this was one of the most narrow-minded and reactionary reviews of the 1960s. Pretty pictures aside, the film's portrait of life under Soviet-style communism is anything but flattering. Warner Home Video's Blu-ray of Doctor Zhivago is the second of David Lean's final four super-epics to come to the Hi-Def format, and it looks splendid. Freddy Young's crisp cinematography is properly represented -- when Tonya alights from the Paris train, her fuzzy coat is the exact correct shade of pale pink. The added contrast range of Blu-ray allows dark scenes to play without washing out. After being confined to dank railway cars, grim communal housing and the muddy grays of the Eastern Front, the blazing colors of the yellow flowers in the Urals (used as a direct correlative for Lara) have the same impact that they had on theater screens. DTS master 5.1 audio turns Maurice Jarre's famed music into a concert (the big overture has been retained) while the added oomph in the track is used to good effect in the Red partisans' cavalry charge. The movie carries a commentary with actors Sharif, Steiger and Sandra Lean, the director's widow; I listened to sections and heard several interesting anecdotes. A second DVD disc contains most of the extras seen on earlier DVD special editions, with a full-length docu and a score of featurettes using archived publicity film and interviews with the cast. Geraldine Chaplin's screen test also survived and is present. A third CD disc contains a sampler of the late Maurice Jarre's popular score, just enough for viewers to want to hear more. I sometimes forget that movies made forty and fifty years ago will be completely unknown quantities to younger audiences of today, who will probably be just as impressed as we were when Doctor Zhivago was new. Warners' packaging is their attractive book-style arrangement that incorporates a glossy souvenir book into the 2-disc holder. We're still celebrating the book and David Lean's lucrative film adaptation, but author Pasternak's life's work didn't bring him much in the way of material reward. Published outside of Russia, the book was of course condemned by the Soviet authorities. Forbidden to accept his Nobel Prize in person, Pasternak was probably pressured to publicly decline it. He died very soon thereafter from cancer. The book and the movie were withheld from Russian distribution for more than twenty years. Supplements: Commentary, long-form docu, featurettes, interviews, screen test, trailer, music score sampler CD, commemorative souvenir book. Packaging: Blu-ray and DVD disc in book-style packaging. 1. Doctor Zhivago is a favorite of librarians everywhere. After unlimited representations of librarians typed as frustrated old maids shushing people, the movie presents us with Julie Christie as the most luscious reading room clerk in history. The town is supposed to be a war-torn ruin, but its library is an inviting little bit of biblio-paradise, with a love goddess at the check-out counter.